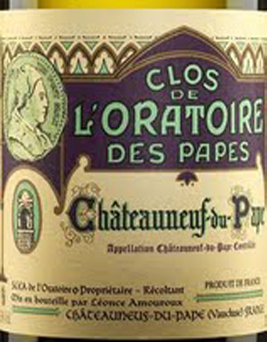 The Chateauneuf Du Pape Blanc by Ogier Clos de l'Oratoire Des Papes is an iconic wine created by Léonce Amouroux in 1880. The tradition of vineyards from the middle age of 25 years takes place in the highest respect of nature. Winemaking is traditional, while the refining takes place in Allier and Tronçais wood briquettes. Elegant flavors, robust and velvety taste, excellent. 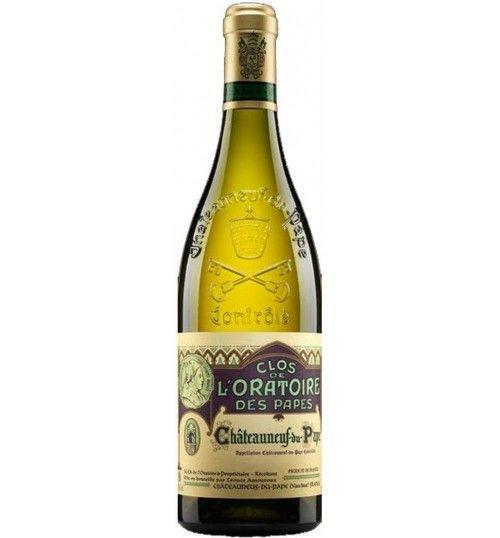 THE WINE The Chateauneuf Du Pape Blanc by Ogier Clos de l'Oratoire Des Papes is an iconic wine created by Léonce Amouroux in 1880. The tradition of vineyards from the middle age of 25 years takes place in the highest respect of nature. Winemaking is traditional, while the refining takes place in Allier and Tronçais wood briquettes. Elegant flavors, robust and velvety taste, excellent. THE COMPANY Clos de l'Oratoire des Papes belongs to Ogier since 2000, as did the Domaine Notre Dame de Cousignac since 2004. Owning these vines testifies Ogier's great commitment to defending the long-term interest in the chain and respect for man, while preserving the diversity and stories of men who share the same values. This savoir-faire «vigneron», characterized by careful selection and respect for the territories and its ecosystems, from grape to bottle, is applied with particular care to all the wines that Maison Ogier produces proudly. Ogier moves beyond his goal of excellence with the sublimation that perpetuates in the aging cellars in Châteauneuf-du-Pape. Named jewel, the cellar is in many respects the essential element of Ogier's quality. Located at the foot of the village of "Puits Neuf", the cellars count 3 Artesian wells pinned in red stone, attesting to an impressive medieval past. The permanent presence of fresh and pure water creates the ideal conditions for an exceptional refinement site. The legacy of an ancient savoir-faire châteauneuvois in barrel production, Maître in the art of refinement, Didier Couturier sublime in its wines the original qualities of Terroir, to reach an unprecedented level in the Vallée du Rhône. Tasting Color: bright golden yellow. Bouquet: elegant aromas of exotic fruit, white flowers and tobacco. Taste: robust and velvety, it develops with balance, fruity fruity flavors. It closes along with harmony and elegance. Clos de l'Oratoire des Papes belongs to Ogier since 2000, as did the Domaine Notre Dame de Cousignac since 2004. Owning these vines testifies Ogier's great commitment to defending the long-term interest in the chain and respect for man, while preserving the diversity and stories of men who share the same values. This savoir-faire «vigneron», characterized by careful selection and respect for the territories and its ecosystems, from grape to bottle, is applied with particular care to all the wines that Maison Ogier produces proudly. Ogier moves beyond his goal of excellence with the sublimation that perpetuates in the aging cellars in Châteauneuf-du-Pape. Named jewel, the cellar is in many respects the essential element of Ogier's quality. Located at the foot of the village of "Puits Neuf", the cellars count 3 Artesian wells pinned in red stone, attesting to an impressive medieval past. The permanent presence of fresh and pure water creates the ideal conditions for an exceptional refinement site. The legacy of an ancient savoir-faire châteauneuvois in barrel production, Maître in the art of refinement, Didier Couturier sublime in its wines the original qualities of Terroir, to reach an unprecedented level in the Vallée du Rhône.